What's the Story? Is This It? The Chicago Tribune calls The Best American Short Stories 2009 "antenna for what is going on in the world." Add a verb and it's a clause to give one pause. We are to rely upon data provided us by fiction writers. Fiction writers, people who by definition have chosen as their life's work to sit at home, alone—often in their jammies—and make things up. The world, as seen by people who don't get out much. But the facts are all there on the evening news (or we'd like to think at least they once were). We are awash in information. What we need is understanding, some way of puzzling the whole thing out, deciding what to make of all the goings-on. Enter the short story writer—in a bathrobe—with a cup of coffee, a compass, a thermometer, a flashlight, a spyglass, a decoder ring. 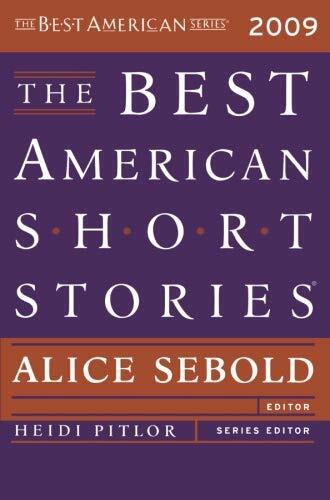 In her introduction, the novelist Alice Sebold, the judge of this year's best short fiction, tells us that these stories will not save our lives. We're fine with that. She does say, though, that, "Narrative is perhaps the most powerful antidote we have in the face of insurmountable odds." Witness, Sebold says, the Incredible Hulk and Holden Caulfield. I am inclined to think if she is right, it matters rather more than less just what the story is, but antidote or not, I do think fiction helps us wonder about things. It frames our questions, fleshes out our puzzlements and longings, gives us time and company to sit with for a few minutes and muse about what's going on within us and among us. In this year's collection, the stories hew to central themes, no matter that the writers have grown up in Peru and Zambia, their stories set in Yemen and in China. No matter that the action happens in a prop plane with John D. Rockefeller, in a submarine during the Civil War, in tiny theaters scattered through Peruvian mountain villages. A man nailed up in an attic during a Louisiana hurricane is about as close to the quotidian lockstep as we get. None of the stories happen in a living room or at a bus stop. They are not set in Cincinnati. Few of the characters have day jobs or pets or house plants. They are seldom very certain, and less often are they merry; here is no pretense of cheer, no charade of mirth.These stories may be safely read in church or in the library or any quiet, public place. The reader will not laugh out loud, I think; though he may sigh. These are stories for the nights when sleep won't come; they'll tire us out, but I am not sure what dreams they'll bring. Characters here seem not to see beyond their stories. And if their lives are lacking art, well so too are the storytellers, a long weariness a thing they seem to share. With notable and quite stunning exceptions (Annie Proulx, Steve De Jarnatt, Rebecca Makkai, Ethan Rutherford, and Greg Hrbek), the stories sparkle neither with the surprise of glory nor in the commonness of days. And, when weariness does give place, it is to pain, and too often, terror, and no answers are forthcoming. Life a puzzle, missing clues. I met a young, very winsome pagan last week, his painted scalp, his dangling chains so finely done. I asked him about God. (As I said, a fiction writer asks the questions; it's what they pay us for—or should.) This man told me he does not require God, that science will soon answer all life's questions for him. But the characters on these pages are having none of that. If they hold out little hope in God, they hold out hardly more in science to explain life to the living. And not one of them will likely hold his breath in anticipation of the prospect I heard offered last night at a lecture. An erudite professor—entirely tenured and respected, even by people who know him—offered his Ivy'd audience the hope that soon philosophy will have crafted a secular "spirituality" (he did not blush or wince, but said the word) that will provide foundation for morality, community, and meaning. The people in these stories would have snorted. In the story "Sagittarius," Greg Hrbek follows two parents out on a dark night meadow searching for their child. The child in question is a deer, or at least part-deer with four legs and hooves and fur, his upper body that of any boy. On this day the young stag—part-stag, part-toddler—has walked for the first time. The child's father has been pushing for operations that would move his son in the direction of normal, but this night something happens in the father's heart to see his son run free across the meadow, and very late he carries his boy home, only to witness the car crash that kills his other son. Science falling silent. Spirituality nowhere to be seen. The stakes are high. Life and death. Sometimes more than life and death, portending horror beyond even that. In Rebecca Makkai's story "The Briefcase," a political prisoner, a chef by trade, steals the identity of a physics professor who has been arrested in his stead. The chef assumes the roles, the friends, the obligations of the professor, almost coming to believe he has become the man; though realizing in his dreams that if the professor ever reclaims his briefcase, the chef will not just lose his freedom but "his place on the earth. The moment his fingers leave the leather handle, he will fall off the planet." Having fashioned his salvation from unwilling sacrifice, he must at any cost perpetuate the ruse, even when he finally meets the professor's wife. And should the very worst come, he lives in hope that one day he might actually convince the Judge that he is not himself, but sinless, falsely accused.